Putin, politics, and industrial policy. One loser, for sure, defense policy. Putin got his 63 percent. He didn’t need fraud to get 50+ percent and avoid a second round, but he (or someone) wasn’t willing to take that chance. The cheating should have drawn a flag for piling on or unnecessary roughness. That it happened says something about Putin’s fear of being out of power. But we digress. Politics won over policymaking, not least of all in defense policy. Yes, Russia is not the only place this happens. It happens in most of the world’s democratic states. This doesn’t prove Russia’s a democracy; it just proves Russia has politics. But so did the USSR. It had fights between industry and the military. Promises and populism secured votes for Putin in Russia’s industrial centers where they’ve waited years for serious defense orders. He’d have won here without writing checks his treasury might not be able to cash. But the once-and-future Supreme CINC made pledges he may hope factory workers forget before 2018. If they don’t, working class disgruntlement may mingle with urban, middle class discontent in an increasingly flammable political mixture. The case in point here is tanks and Uralvagonzavod in Nizhniy Tagil. Did Putin court anyone, or any defense enterprise, more than the General Director of UVZ Oleg Siyenko? Did anyone get comparable preelection attention? The closest we get is Putin’s intervention between the Defense Ministry, OSK, and Sevmash to solve their submarine pricing dispute last fall. But industry didn’t exactly get everything it wanted in that case. In an election day press-release, this industrial chieftain all but admitted his employees were ordered to vote for Putin. Most probably never entertained the thought of doing otherwise. UVZ likely didn’t have to organize “carousels,” but “corporate voting” might have occurred. On February 20, Putin declared 2,300 “new generation” tanks will be produced (by UVZ) under GPV 2020. 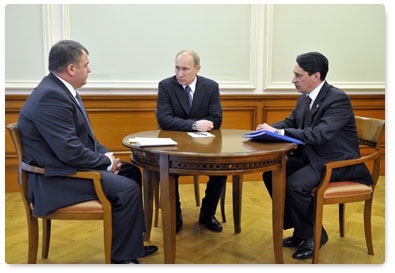 It was just February 15 that Putin had a meeting with Defense Minister Serdyukov and Siyenko. It was actually more of a beating, for Serdyukov. The Defense Minister had to back down publicly from everything he’s said about tank acquisition over the last couple years. He acknowledged, as Putin said, there will be a new tank from UVZ in 2013 that will enter series production in 2015. And, for good measure, Serdyukov said the manufacturer will receive 100 percent advance payment on the GOZ. As recently as January, the Defense Minister was lamenting huge stocks of old tanks and repeating his willingness to wait for fundamentally new armor rather than “new” T-72 or T-90 models. In mid-2011, he criticized tank makers (UVZ) for dressing up old ideas, and said the army would just settle for updating its existing armor inventory. Yes, everything changed sometime between then and now. It was just prior to this Putin-Serdyukov-Siyenko session that General Staff Chief Nikolay Makarov again criticized the tanks offered to the army and argued for the military’s predominance in weapons procurement decisions. Deputy PM Dmitriy Rogozin objected fiercely to Makarov’s public airing of dirty linen, and declared himself chief of acquisition. All official doubts and complaints about Russian tanks heard in 2009, 2010, and 2011 were swept away in a stroke by Putin’s announcement. It seems the Ground Troops — its supporting industry actually — were feeling left out of the GPV and GOZ. Tanks were never one of Russia’s priorities as enumerated by former armaments chief Vladimir Popovkin. What do 2,300 tanks mean for the world’s largest country? One that once measured sufficiency in tanks by the tens of thousands? Is staving off a NATO ground attack really a top concern? Would Moscow entertain putting most of its new tanks opposite China? There’s been plenty written (including by Russians) about the end of the tank era. What do these tanks mean for the GPV? If they cost 200 million rubles per, the cost of the production run (if it actually happens) will cost close to 500 billion of the GPV’s 19 trillion rubles for procurement. It’s a lot for one system. The Putin-brokered sub deal in November was worth only 280 billion rubles. So to return to the original point of this meandering post, these tanks are about industrial policy, updating the human and technical capital to make them, keeping a significant industrial center quiescent, and retaining the capability to sell tanks abroad. There are, after all, other armies possibly facing big tank battles in the future. When politics and defense intersect, the latter yields. Nothing shocking in that, one admits. Siyenko’s an interesting character. The 46-year-old former bike racer and past President of the Russian Cycling Federation spent most of the 2000s as General Director of Gazprom subsidiary Gazeksport (Gazprom Eksport), selling natural gas to the Europeans. From 2003, he was a deputy chairman of the shady gas intermediary Itera. Itera Chairman Vladimir Makeyev too is a one-time world-class rider who succeeded Siyenko as the cycling federation’s head. 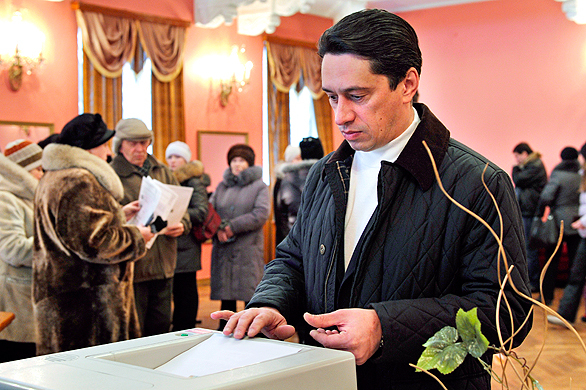 But suddenly in 2009, Siyenko changed tracks, and went to Sverdlovsk Oblast and UVZ in Nizhniy Tagil. There must be a story explaining why he’d abandon gas for tanks and railcars. This entry was posted in Civil-Military Relations, Defense Industry and tagged Election, GOZ, GPV 2020, Nizhniy Tagil, Oleg Siyenko, OPK, Tanks, Uralvagonzavod, UVZ, Vladimir Putin. Bookmark the permalink. With all due respect for your efforts, it is ludicrous to analyze Russian policy on the basis of public statements and events. All such occasions are deliberately staged and have no constructive purpose. What you ought to do instead is ignore public statements and focus on policy results, which it is far more difficult to disguise. Sienko is a very low ranking assistant of Chemezov, who has no influence over his own career.